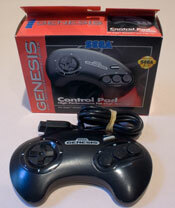 I have a lot of good memories with the Genesis, which was released when I was in college. I bought a system (not this one) from a friend in my dorm for $90 used – a good deal at that time, only about a year after launch. 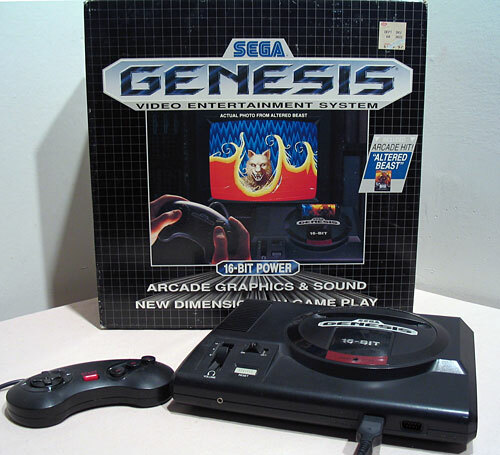 The Genesis was the system of choice for sports gamers, which made it a perfect dorm system, and we’d have almost nightly NHL Hockey tournaments on various Genesises (Genesi?) around the dorm. This also gave us an excuse to actually leave the enclosed island of our dorm once in a while, as Blockbuster had just started renting games and we went nuts renting pretty much everything under the sun on a collective basis. At some point after college I got stupid and decided I’d trade in my system. I took it to a store along with all my games and got something like $15 for the whole thing. I almost immediately felt some serious regret. I think that single experience, more than anything else, is what flipped the nostalgia switch and got me into retro gaming in earnest – I started thinking about all the systems I’d owned (and all the ones I wanted but never did own) and all the memories I had with them. Not easy to find the original 3-button controller in a box these days, and this one’s basically in new condition. It’s in a lot better shape than the system itself. I’m sure I bought this particular system for the box, which is in pretty good shape, and it’s the original Altered Beast system that I had in college. I’ve been scouting for a replacement Genesis unit but it’s not easy to find one loose in the kind of condition I want – well taken care-of systems usually include all the extras that I don’t need and that only drive up the price. Good times, though. And the Genesis is not just a sports system, either – probably my favorite 16 bit franchise of all is the Sonic series, and there were a lot of other great games for the Genesis beyond that. Definitely one of Sega’s high points. Great to collect for these days too – I’ve been noticing some rising prices lately, but it’s still generally pretty easy to find even really good games for a buck or two a piece. Many of these games still hold up well today. Pingback: boynas Blog // Un blog de cosas bien chilas!